National Economic Council Director Larry Kudlow talks to the press outside the West Wing of the White House in Washington, D.C., April 6, 2018. The U.S. is “in the pre-preliminary stages of any discussions” on rejoining the Asia-Pacific trade deal, Kudlow told reporters Tuesday during a briefing ahead of a meeting between President Donald Trump and Japanese Prime Minister Shinzo Abe. Kudlow said the U.S. would like to reach a separate free-trade deal with Japan. He added that an exception for Japan on steel and aluminum tariffs that Trump recently announced would be “on the table” during the summit with Abe. “It’s a key point on the agenda,” he said. 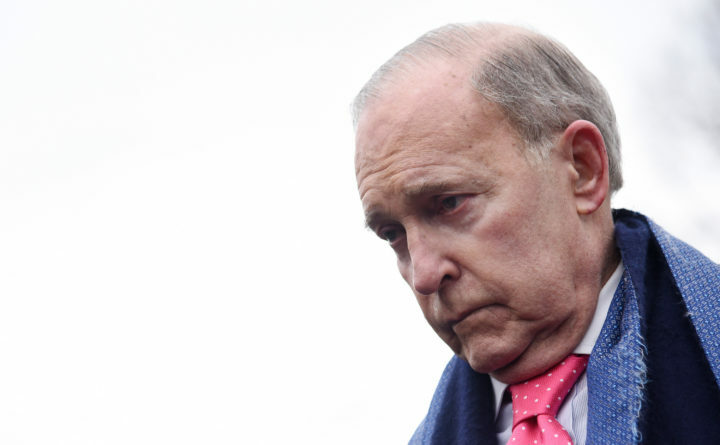 Kudlow added that U.S. trade negotiations with China over grievances Trump has raised against Beijing will be “very separate” from consideration of rejoining TPP. China hasn’t been part of the TPP negotiations while Japan is a member of the accord. Trump last week told farm-state lawmakers and governors he had designated Kudlow and U.S. Trade Representative Robert Lighthizer to examine joining TPP, which the Obama administration had negotiated but the U.S. never ratified. Trump withdrew from the pact after he took office.